After months of speculation, the release of the budget this week came with no real surprises. Here’s what you need to know in relation to property. As expected, negative gearing was kept off the agenda. Even under Labor’s plan, negative gearing would still apply to the purchase of new housing. The opposition’s policy risks creating a two-tiered property market with higher demand for new property, inflating prices above fundamental levels. In addition, the resale market for second-hand property will likely diminish, further exacerbating the potential premium on new property. The introduction of a 50% cap on the total number of dwellings a developer can sell in any given project to foreign investors. This will be applied as a condition on applications submitted after 9 May 2017. The only real impact this budget will have on property investors is that capping foreign investment will make it harder for a development to get off the ground, therefore restricting new property supply. We’ve reported for a while now that the market tends to self-regulate supply and demand. Regulatory interference is likely to limit supply further, which isn’t a positive for housing affordability. Economist Saul Eslake hit the nail on the head when he said it’s ‘much easier for them (regulators) to make housing affordability worse rather than better’ and the government appeared to be toying with ‘more ideas that would make it worse’. Ultimately, restrictions on foreign investment make local investors, all of you reading this right now, a crucial component in project feasibilities. This gives us great negotiating power when we first acquire a project and allows us to get you some awesome incentives when you purchase. It’s a great time to be in the market. One of the key things I’ve learnt in my career is the importance of keeping perspective and bring moderation to situations. This is important in life and in property. I have found that fleshing out a problem helps make it a little less intense. One term I often use when discussing property with clients is not to ‘jump at shadows’. This works both ways and can either lead to a rash decision to purchase or sell a property. The ‘shadows’ are often created by media hype. Whether the media are advocating property as a quick wealth creation scheme in which you can’t lose or forecasting the impending property crash. We understand that property markets are cyclical and they often move in 10 – 15 year cycles. Our role is to find a market which presents an opportunity or value for our clients and to do this we find ourselves working counter cyclically. We encourage our clients not to fall into the trap created by media hype on either end of the spectrum. In the current environment, reports are often relating to oversupply, market sentiment and the bursting property bubble. The truth is, a property market crash is defined as a 10 per cent fall in median prices over 12 months, which has never occurred. It is unlikely to ever occur based on the fundamentals of our market. There will always be a good place to invest in Australia and it is our job to find it. Property investment is a long term game and isn’t a get rich quick scheme. The stability of property as an asset is often forgotten in markets with a negative sentiment. This can lead to the resale of a property prior to a market upswing. The key is to resist the urge to jump at shadows and keep perspective. In 2013 I had a number of clients who had purchased in Sydney in 2009 calling and asking, ‘why hasn’t our property increased in value?’ A few clients sold and, within the next 18 months, prices increased by over $130,000. It is important to always take a long term approach to property investing. Get educated and deal with people who can assist you on your journey. Over recent months, we’ve been constantly confronted with media headlines screaming oversupply. As many of you know, moderation and perspective aren’t the media’s strong point. Part of Blue Wealth’s job is to analyse the property market and provide a research-based opinion on the real position of the market. Interest rates are at historic lows, which means developers can get cheaper money. This has led to an increase in the number of feasible developments and an increase in ‘one hit wonder’ developers. More developers and developments means more supply. This increasing supply has increased the demand for builders, tradespeople and building material. As a result, we are beginning to experience significant increases in construction costs. What does this mean for the market? It means many projects, even those with an approval, will no longer be feasible. What developers have saved on interest on construction loans has been swallowed by the increased cost of building. This shift will mean that many currently approved projects won’t get off the ground. The Financial Review reported that approximately 30 per cent of approvals are unlikely to start. We are currently witnessing this in Brisbane, Sydney and Melbourne in particular. In the last few months, construction costs have risen dramatically and what most commentators have missed is that although there are many approvals in the pipeline, the likelihood of them being built is reducing by the day! It’s more important than ever to ensure that our clients are investing in the right property to maximise their opportunities for strong tenancy and a strong future exit strategy. Negative gearing is one of the hot topics around property at the moment. It’s a topic of high interest, that often polarizes opinion. Many of you know that Blue Wealth offers new property exclusively. We have a philosophy which supports new property over existing dwellings for a number of reasons. New properties provide tax benefits, depreciation benefits and lower maintenance costs, which reduces your holding cost making it easier to hold property for the long term. From Blue Wealth’s perspective the Labour opposition’s policy suggestion that would see negative gearing limited to only new property is short sighted and potentially destructive. Now because we are only selling new property you would assume that we would welcome this change. However, our job is to help our clients create wealth not just sell them a property. The model that we have built over the years is one that brings success to all stakeholders. If Labour’s policy was introduced, the second hand investor market will essentially disappear, which would severely limit the exit strategy for our clients and impact their ability to create wealth. The argument against negative gearing is driven by the need to deal with the countries dissipating affordability. However, if negative gearing is abolished the number of investors would significantly decrease which would then lead to a substantial reduction in supply. Developers are less likely to take the risk of providing new market supply if there are fewer buyers in the market place. Less supply and sustained demand will only drive prices further up and will also have an adverse effect on the rental market, driving rents up. This will only create a new problem. Negative gearing works. The policy costs the government a lot less per dwelling than public housing. My opinion is that the government will not make any material change to the policy in the upcoming budget. As we have seen many times before, the beginning of the year has brought many different opinions and perspectives on the state of the current market. Moderation and perspective are principles Blue Wealth has always promoted when it comes to opinions about the property market. One of the challenges Australian investors face is living ‘above the noise’ created by the media and the opinions of the many ‘property experts’ regarding current market conditions. The reality is, if you want to build wealth through property you need to have a long term focus. Buying good assets, investing within your means and holding for the long term are the three fundamentals of successful property investment. It’s important to apply perspective to general market opinion. There are periods of strong positive sentiment when overconfidence is an investors biggest risk. We know investors make silly decisions when frenzied market momentum, rather than research, is the key driver. Same applies when markets carry strong negative sentiment. Most of my best investment decisions have been made in markets considered to be flat or stagnant. My most lucrative investment period was immediately after the GFC when the media was telling me the whole world was about to implode and markets were going to crash. I didn’t panic. I turned to the research and reaped the rewards a few years later. The advantage of using research to make decisions is that is helps bring moderation and perspective to the decision making process and inevitably leads to better choices. This has been proven year on year with thousands of our clients. So it is important that you take what you hear in the media with a pinch of salt and make sure you keep focused on your long term plan. Nothing significant in life is ever smooth sailing the whole time. If we think about our relationships with partners, parents or children. There are ups and downs with every significant relationship we have in our lives. Same applies when it comes to property and creating wealth. Remember to maintain perspective and hold your assets for the long term… if you do that your chances of creating real wealth increase exponentially. Dr Tony Hayek is the CEO and Founder of Blue Wealth Property. He has spent the past 15 years accruing a range of skills in the Australian property sectors, having experience as a property developer, business consultant, sales manager and research and acquisitions adviser. Tony holds a PhD in Organisational Psychology and is married with three beautiful children. Coming from a working class background and driving taxis on weekends to get him through university, he created his wealth through property and is passionate about teaching others how they can too. Tony's advice and recommendations are sought after by investors, mortgage brokers, financial planners, real estate agencies and developers. He regularly appears on Your Money, Your Call (Foxtel) and you may have also seen him on Sky Business News (Foxtel), Lateline (ABC) and 6.30 with George Negus (Channel 10). 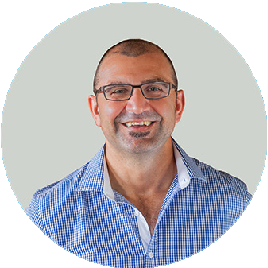 Tony’s opinions and articles are regularly published in The Sydney Morning Herald, Financial Review and specialist magazines for mortgage brokers, financial planners, accountants and investors.